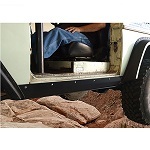 Rocker panel protection is a must for any rock crawling adventure. Why take the chance of demolishing your thin pretty rocker panel sheet metal? 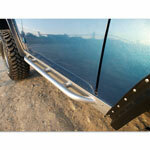 The 1/4" thick steel rocker guards will keep you from having to spend a bundle on body work. 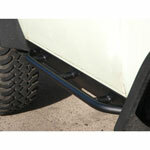 WH guards come uncut so you can fit them perfectly to your Bronco no matter what brand or position your flares are in. They will fit everything from an uncut Bronco to a Gorilla Warflare install with the flares stretched to the max. Mounting holes on the back side of the guards are pre-drilled for you. The fronts are not so, you can get your hole spacing perfect for your rig. The 1.5" .120 wall nerf bars are attached to the Rock Rails in five spots. Completely welded for superior strength and rigidity. These will help keep the rest of your sheet metal away from potential damage. They are worth the $$$. I am so glad I got these things, they saved my Bronco.